30+ Bridesmaid Dresses to give all you Indian Bridesmaids out there tons of inspiration for the upcoming Wedding Season! We are getting a lot of requests for bridesmaid dresses ideas given the Indian wedding season is around the corner and to make your bridesmaid dress search simple, I have listed down some tips that you can keep in mind while selecting your Indian bridesmaid dress. What’s more? I have also added some amazing Indian bridesmaid dresses for you to pin and share with your girls and finalise on something that all of you like! Scroll on, tell me which bridesmaids dress you loved the most! 1. Consider your bridesmaids’ style while choosing the dress. You might be best of friends and have styles that are poles apart. If you are not fussy about matching outfits, then give your bridesmaids the freedom to choose what they want, while keeping one element common. You can choose a common colour palette, similar print/embroidery or a similar style of bridesmaids outfit, for eg: a Kanjivaram saree! Don’t these bridesmaids dresses look in sync despite wearing different colours? You know why? They have stuck to the pastel palette and added a floral tiara to show that they belong to the bride tribe! Or perhaps, these beauties who chose a lehenga and a saree but still look more synced than ever. 2. Choose bridesmaids dresses that complement your bridal outfit. Maybe pick a colour from your outfit and use it as the colour inspiration for your bridesmaids’ outfits! Notice how the bridesmaids have picked pink from the bride’s skirt and used it in their blouses? That’s the kind of complementing I’m talking about! 3. Consider your bridesmaids’ budgets. Just because you like a bridesmaid dress that is for 10,000, doesn’t mean all of them can afford it. Prior to finalising an outfit, decide amongst yourselves how much is a decent budget to buy the Indian bridesmaids dresses. 4. Pick a bridesmaid dress that can be reused again for some other occasion. Refer point 1 again. If you pick a sharara because you like it, but the bridesmaids don’t, then they might wear it to your wedding to make you happy. But will they reuse it? Nope! That’s why it is better to pick something that everyone can wear more than once! Bridesmaids lehengas are the most sought-after Indian bridesmaid dresses. You can match it up totally or go crazy experimenting with styles as you wish. Take a hint from these women rocking a great lehenga that you can use can take inspiration and wear for your BFF’s wedding! These lovely bridesmaids with different lehengas that still look as coordinated as ever! You can even choose a Banarasi lehenga in different colours and keep the top or shirt exactly the same for a synced look! Peplum tops with lehengas are huge right now! Can surely use this as an inspiration for your bridesmaids dresses. Sarees in a desi woman’s closet are timeless. Ask your mom and she’ll tell you a tale behind every beautiful saree she owns! 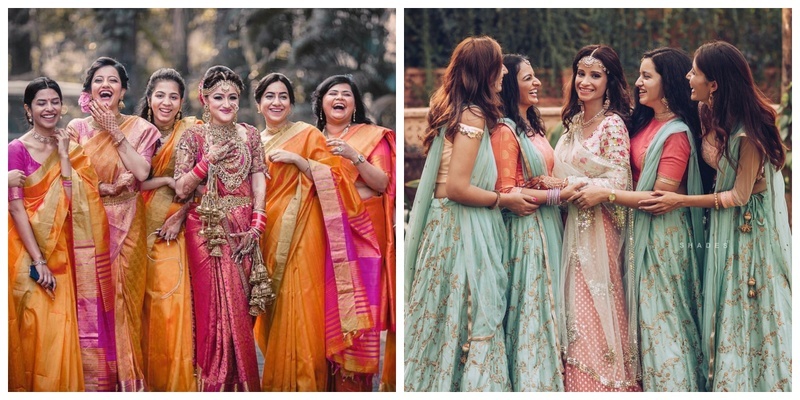 If you are going to have a typical desi wedding and want your bridesmaids dresses to be sarees, then have a look at these cool bunch of women rocking the 6-yard like a total boss! Is burgundy your wedding outfit’s main colour? Or do you want burgundy bridesmaid dresses for your BFF’s? Well, take a cue from these beauties and see how they have complemented their bridesmaid sarees with the bride. Maroon bridesmaid dresses come very close to burgundy bridesmaid dresses. Maroon is a very desi colour and you can literally find hundreds of sarees in this colour that your bridesmaids can wear. Don’t these ladies look gorgeous in their purple bridesmaid dresses? I totally love how matching bridesmaids sarees can take the whole bride tribe’s look to another level. Move over red bridal dresses. Make way for red bridesmaids dresses that are beautiful matching sarees! Gold bridesmaid dresses are a safe and stunning option to wear for your bestie’s wedding. If she is wearing a pattu saree, all the more better if you choose for Indian bridesmaids dresses in the form of a beautiful golden saree. Not a fan of matching bridesmaids dresses? Pick a colour theme like pastels, choose a fabric and create your look around that. Take a cue from these ladies rocking bridesmaids sarees in elegant pastel shades in organza! Pink is the most preferred colour for bridesmaids dresses, and it definitely looks beautiful on all skin tones. If you too are looking for pink bridesmaid dresses, then consider a simple pink saree with silver or golden border for all your girls! Shararas as bridesmaids dresses look royal. They have a heavy look, which make they an appropriate bridesmaid dress for those of you who want to look all dressed and dolled up for your bestie’s big day! Or go for matching ones to sync like a team! Anarkali Indian Bridesmaids Dresses are the perfect option to wear for your sister’s or bestie’s wedding. They don’t only look festive, but can be used multiple times for other occasions unlike lehengas and shararas! If you are looking for bridesmaids dresses online, and have finalised on wearing an Anarkali suit, then you can choose to wear something like this baby pink floor-length anarkali. Shop here! So ladies, which of these Indian bridesmaid dresses did you like enough to share in your wedding prep WhatsApp group?